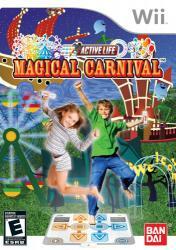 Use the Wii Remote & the Active Life Mat Controller to play in a virtual theme park! Explore an array of vividly imagined carnival attractions including haunted houses, a lively circus tent, a pirate ship on the high-seas, a colorful parade and exciting fantasy zone. A veritable thrill-ride of activities will keep you moving as you tame lions, steer pirate ships, explore haunted houses, ride a flying carpet and much more. Unique play modes let you play with up to 10 players!